" Those villages must continuously monitor the flood-prone areas to anticipate puddles and floods"
Around 16 disaster alert villages (KSB) in East Jakarta are ready to face puddles and floods during the rainy season in each residential area. Even the supporting facilities have also been alerted to serve the refugees. 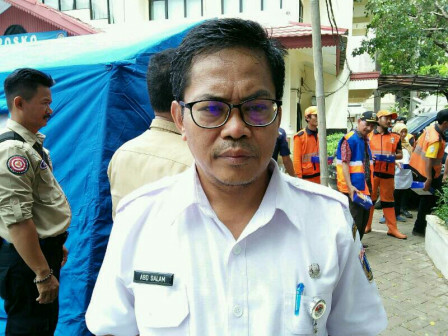 "Those villages must continuously monitor the flood-prone areas to anticipate puddles and floods," disclosed Abdul Salam, Section Head of Protection, Social, and Poor People Handling for East Jakarta Social Sub-dept., Thursday (11/15). Of 16 KSBs, among them are Kampung Melayu Urban Village, Jatinegara, Cipinang Melayu Urban Village, Makasar, Cawang Urban Village, Kramat Jati, Rawa Terate Urban Village, Cakung, Kampung Dukuh Urban Village, Kramat Jati, etc. "Fund for forming the KSB is from the Social Ministry. Yet the facility provision is from Jakarta Provincial Gover nment," he stated.